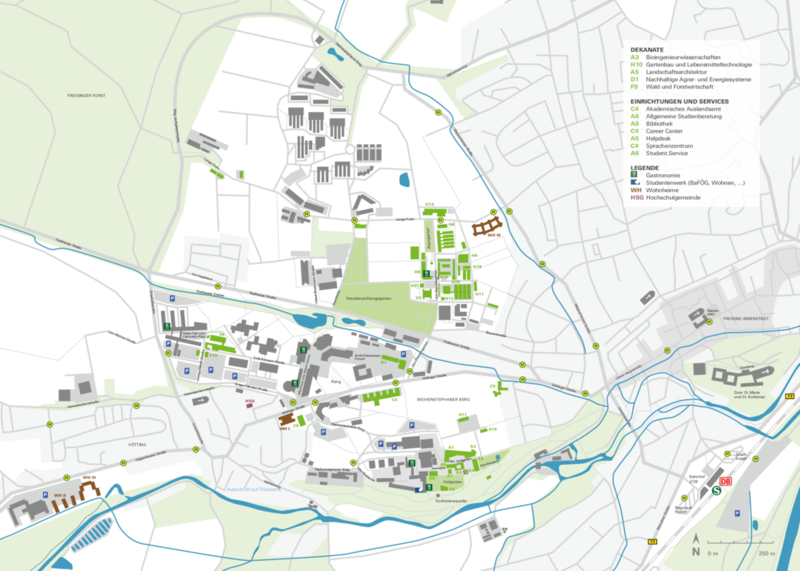 The Weihenstephan campus is located in the Weihenstephan neighbourhood of Freising. The town of Freising is approximately 35km north of Munich, and is readily accessible by car, train/suburban train (S1), and plane (Munich airport). A9 to the Allershausen exit, and A92 to the Freising Süd (south) and Freising Mitte (centre) exits. Please bear in mind that parking is very limited on campus. Freising is on the Munich-Regensburg and Munich-Passau lines and also on the suburban S1 line from Munich. The railway station in Freising has two large covered cycle parking areas. There is also a repair station at one of these parking areas. 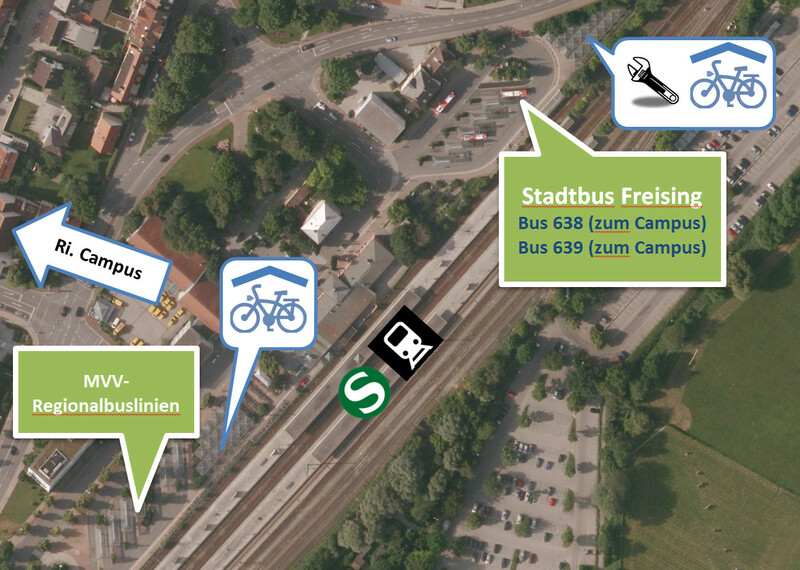 From Freising railway station, take bus route 638 (every 12 minutes, travel time 8 minutes, stops 'Am Staudengarten' and 'Weihenstephan') and 639 (every 30 minutes, travel time 6 minutes, stops 'Am Staudengarten', 'Weihenstephan', 'Weihenstephaner Berg' and 'Forstzentrum') to the Weihenstephan campus. Additional services are in operation between the railway station and the campus in the mornings. 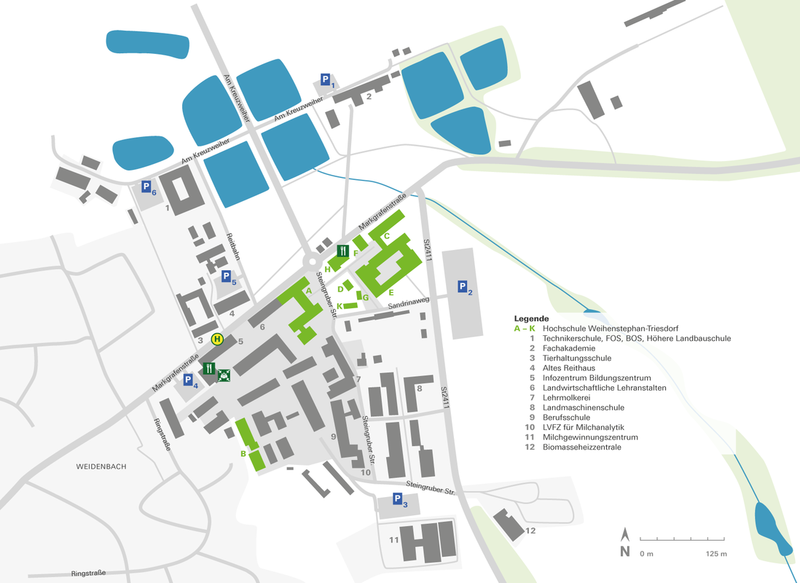 The campus can also be reached from all other areas of Freising with just one change at Freising railway station or in the city centre (stop 'Obere Hauptstraße'). Timetable information is also available on a smartphone app which you can get from the iOS App Store and Google Play Store. The buildings at Weihenstephaner Berg (A1 – A10) and on the Weihenstephan campus (C4 – C6, F9, H6 – H14) can be reached by bicycle in around 10 minutes. The walk from Freising railway station to the buildings at Weihenstephaner Berg (A1 – A10) and on the Weihenstephan campus (C4 – C6, F9, H6 – H14) takes a good 20 minutes. The site plan is available as a PDF file. Triesdorf is approximately 11km to the south east of Ansbach. Take the A6 and turn onto the B13 (between Ansbach and Merkendorf). Turn off at the sign for "Landwirtschaftliches Bildungszentrum Triesdorf". Triesdorf is on the Ansbach-Augsburg line.